image courtesy of East New York Farms! Furthering a tradition of urban gardening that spans at least three decades, East New York Farms! 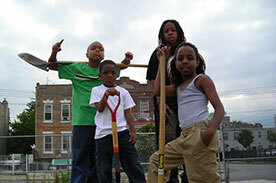 is a Brooklyn based non-profit focused on food justice, urban agriculture and community education. Historically overlooked for funding, littered with abandoned properties and better known for urban crime than urban gardening, East Brooklyn Farm! has emerged from a troubled past through the efforts of established residents and new immigrants. One of New York’s outlying suburbs, East Brooklyn has a colorful history punctuated with the neglect and abandonment of white flight and a newer, more diverse population caught in a state of flux and change. East Brooklynites have learned self-sufficiency the hard way. “People have a history of trying to do things for themselves,” says Deborah Greig, Agriculture Director at the farm since 2007. Greig has been passionate about urban farming since her school days and views the role of East New York Farms! as facilitating a more-than-capable but ever diverse urban population. Many of the farm’s growers began in their back yards and own a plot on the farm to share their experience with a younger generation in need of direction. East New York Farms! began in 1998, but is a part of the pioneering United Community Center that began in 1954. Currently consisting of two half acre lots (UCC Youth Farm and Hands and Heart Garden), the urban farms offer plots to area gardeners and would-be growers, providing the space, seeds and platform for growing and selling locally grown produce. When the farm, began there were four grocery stores in the area. Today, there are nine. Food justice and accessibility remains an issue for this community, but encouraging locals to create their own source of fresh food is a big part of East New York Farms! mission. The East New York Farms! farmer’s market has become a neighborhood staple over the years. Beginning with two growers in 2000, today the farmer’s market has two locations and over 17,000 customers annually. W. Rogowski Farm facilitates a CSA through the farmer’s market, and East New York Farms! has a share table where folks can donate food to ensure enough fresh food is available for locals during the June through November season. Specialty crops such as karela, bora and callaloo are grown by immigrants from the Caribbean and only available at the farmer’s market. Education is at the core of East New York Farms! as children and adults alike establish a more informed relationship with their food and the possibilities urban agriculture has to offer. Beginning as an internship program with five applicants, today the UCC Youth Farm intern program takes 33 students each season, with over 100 applicants annually. The nine month program provides youth with the skills not only to grow vegetables, but the confidence and background to be community leaders and future entrepreneurs. During the winter months, the community center provides cooking classes, gardening workshops and presentations by local professionals. Programs like East New York Farms! are precariously funded in New York but their partnerships provide security in a culture that depends so much on Internet-based funding. Despite the challenges, East New York Farms! continues to flourish, bringing together young and old urban growers to create a more stable and a more sustainable East Brooklyn community.